Mercedes GP Petronas began the on-track preparations for one of the team's home races today, with the first two practice sessions for the British Grand Prix taking place at the Silverstone circuit in Northamptonshire. Nico Rosberg: "It was difficult out there, however our car worked well in these conditions, and maybe we have a better pace in the wet. The Pirelli intermediate tyres were certainly performing well today. We will have to wait for dry conditions to get a true picture of our updates as we weren't able to achieve all of the work that we would have liked, so tomorrow will be important for us." Michael Schumacher: "It was difficult to judge the real performance of the car today as the conditions were never consistent enough to achieve a proper analysis of where we are. So I won't make any conclusions from today's practice sessions until we have the chance for some dry running tomorrow. However I'm confident that it was a good first day of our Silverstone weekend and I'm looking forward to one of our home races. 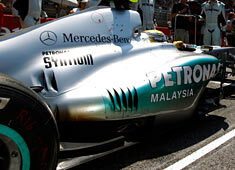 We are continuing to develop step-by-step and make improvements to the car." Ross Brawn: "We've had a pretty constructive day and were able to achieve quite a lot with the new aerodynamic and exhaust package. Of course, it is difficult to judge in these conditions, and it would have been beneficial to be able to run it in the dry, however the two sessions still proved useful. The car looks reasonable here and we will make the decision tonight about what we do for tomorrow, when we await dry conditions with interest." Norbert Haug: "It was a perfect English summer's day in Silverstone, just like we know them from the Nürburgring! In wet conditions like today, it is very difficult to draw an accurate picture of our performance compared to our competitors. Both drivers did a good job in the difficult conditions, pushing hard without any major incidents, and the car seemed to perform well both on intermediate and wet tyres. However, if conditions are dry tomorrow and Sunday, we will learn much more about our true position compared to the rest of the field."